Let's get on with the Highlights. Of course, after #1 Havre de Grace in the Woodward, and maybe one or two others, even I'm not so sure about the order of my own rankings. In fact, there are plenty of highlights that don't even make the Top Ten+ list. A Top 25 or 50 would be easier. But the ones that do make these Highlights are undoubtedly deserving. Enough! Let's get on. The 6 year old son of Tiznow, who was victorious in the Grade 1 Metropolitan his last time out in May, won big in the Grade 1 Whitney over a very deep field. Suburban winner Flat Out, last year's Empire Classic winner Friend or Foe, Carter winner Morning Line, last year's Donn winner Giant Oak, and New Orleans Handicap winner Mission Impazible were among those running the mile and an 1/8th. Tizway took the lead in the stretch and won by an unchallenged 3 lengths. 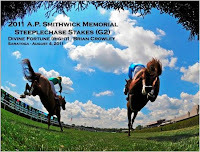 In the mile and an 1/8th Grade 1 race for 3 year old fillies, the field included Mother Goose winner Buster's Ready, Fantasy winner Joyful Victory, Black-Eyed Susan winner Royal Delta, as well as Acorn winner It's Tricky and Kentucky Oaks winner Plum Pretty. The latter 2 battled neck to neck through the length of the stretch, until Tricky triumphed in the last several yards by less than a length. 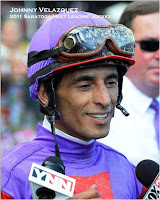 Tricky--known to be a handful--then dumped her rider, Eddie Castro, when he dared to cool her off with a sponge on the way to the winners circle. 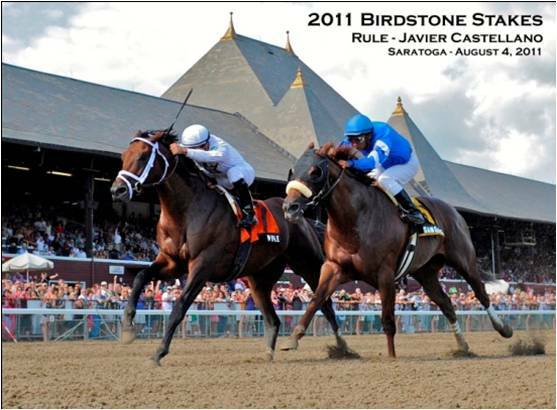 In another thrilling duel, 4 year old Rule by Roman Ruler and 6 year old Sangaree by Awesome again went wire to wire, changing leads for a mile and an 1/8th, until Rule--egged on by Javier Castellano--stuck his neck out at the finish line for the victory. A gutsy, hard-fought, rousing run by both horses. 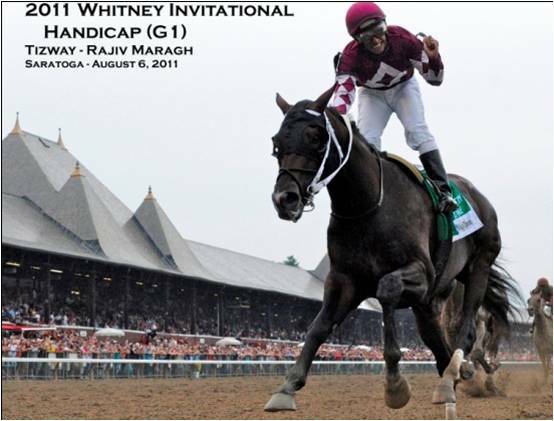 For the 2d year in a row, the eight year old gelding was victorious in one of Saratoga's premiere steeplechase races. Behind the leader, Decoy Daddy, by 2 and 1/2 lengths at the top of the stretch, Divine Fortune pulled ahead to win by 2. The victory gave trainer, Jonathan Sheppard, the winningest steeplechase trainer in the country, his 6th win in the Smithwick. Here's one to keep an eye on next year--and next weekend. 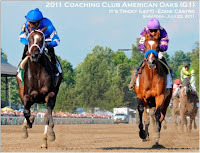 In the 6 and 1/2 furlong, Grade 2 stakes for 2 year olds, Union Rags just crushed the field, winning by a widening 7+ lengths for his 2d in a row. Rags, the son of Dixie Union, went on to crush another field 2 months later in the Grade 1 Champagne at Belmont. (That's the photo.) Bumped and then blocked, he was taken wide by Javier Castellano and then blasted past the rest to win by an increasing 5+ lengths. 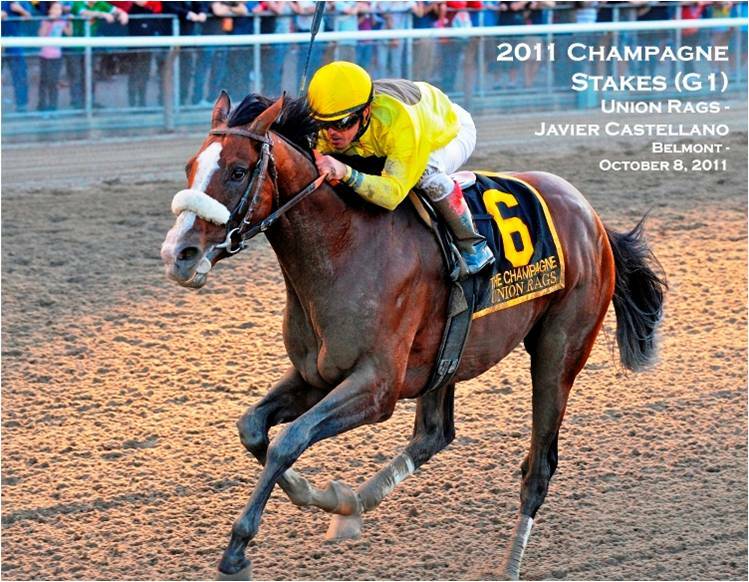 Now 3 for 3, he is likely to be the favorite in the Breeders Cup Juvenile. Yes, lucky #13. 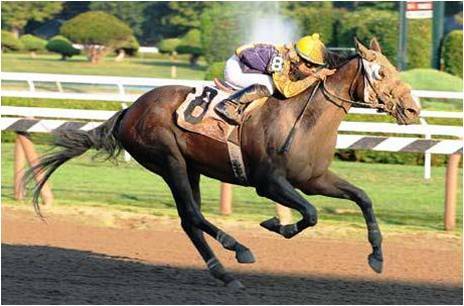 And whether it was luck or ability, the 3 year old went off at 66-1 in the 11th race of Sword Dancer Saturday at Saratoga. A 22k maiden claiming for New York breds. Ess Shape was 5th at the top of the stretch when he found an extra gear, or 3, and with 21 year old Abel Lezcano on board, flew past the leaders to win by a startling 4+ lengths. Favorite longshot of the meet! No one in the crowd of more than 33,000 was more delighted than 85 year old Hall of Fame trainer, Frank "Pancho" Martin, who had won his first at Saratoga since 2005. 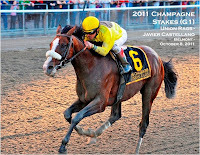 Just can't talk about the Saratoga meet of 2011 without mentioning the top jockey and top trainer. Both racked up a huge number of victories. 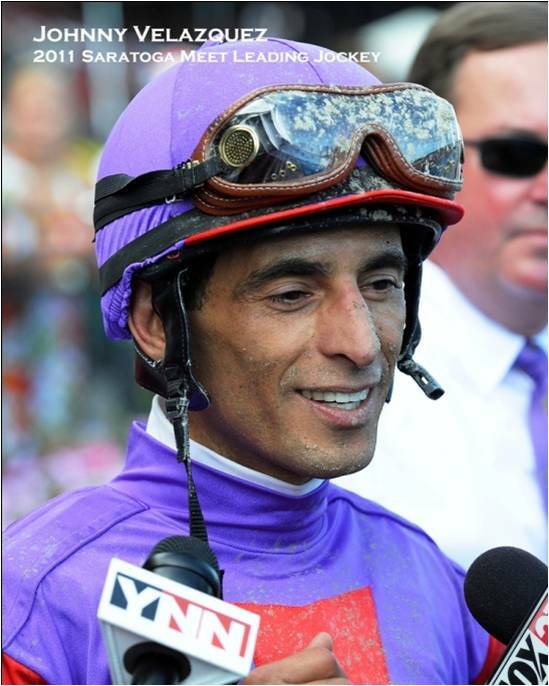 Johnny Velazquez, with 54 wins, moved into 2d place for all-time Saratoga success behind Jerry Bailey. 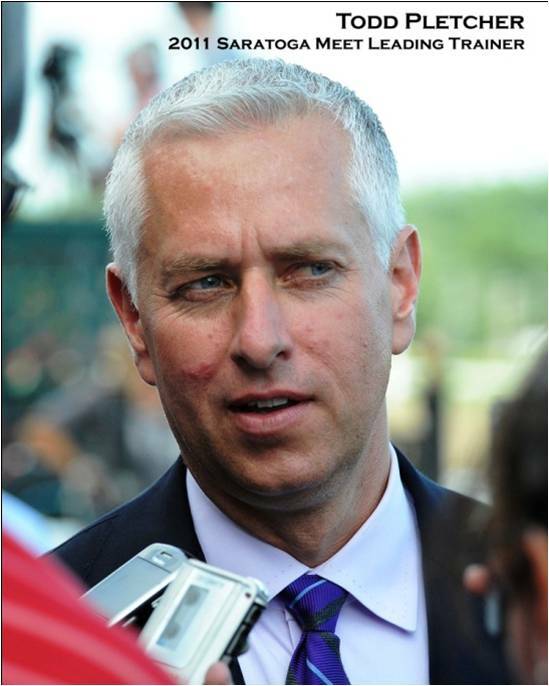 Todd Pletcher, with 38 wins, beat the record he set himself last year. When working together, a lethal combination at the Spa, they were victorious 31 times. And now the countdown begins till next year. It actually began on the last day of the meet. And "still the days, those lonely days, they go on and on." Yes Frank, until next year, for all of us who just love Saratoga, they sure do.